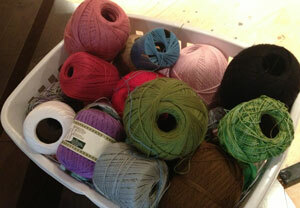 For those who entered into our Thread Yarn Giveaway Draw, I’ve just done the random draws. We received 1225 entries. This entire bin ranging in different brands and thicknesses are being given away. This is from my personal collection. Though I like the look of thread yarn, I am unable to crochet with it easily. I have a preference for large hooks and thick yarn to be honest with you. As a side note, the winners will be randomly receiving items in this bin. Thank you to all who participated. All emails for the entries will be deleted. We do not keep your emails or add them to our mailing lists as Cathy and I like to guarantee that I protect your email privacy. Our next crochet challenge begins tomorrow from Sept 9th – October 10th, 2013. This is part of Cathy’s Hook Club where we will be giving away a Fully Loaded Red Heart Yarn Bag and Crochet Crowd Goodies to 1 lucky person who participates in our challenge! This entry was posted in Crochet Challenges. Bookmark the permalink. Congrats to the winners, enjoy!! WOOOOOOOO HOOOOO!!! THANK YOU SO MUCH!!! EXCITED! congrats to all the winners. Mikey you are the best. Sorry it wasn’t me but congrats to all that won. Congratulations to all the winners…enjoy!! Congrats to all who won! Do these draws include people from Canada too? congrats to all of the winners!!! And Thank you Mikey for having this giveaway!!! You are the best!!! !